I’ve always had a bit of a soft spot for polka dots, which I think is down to my mum and nan always reminding me of how cute I used to look in my blue and white swimsuit from when I was about 4 years old. Slightly cringe, but also kinda cute I guess? 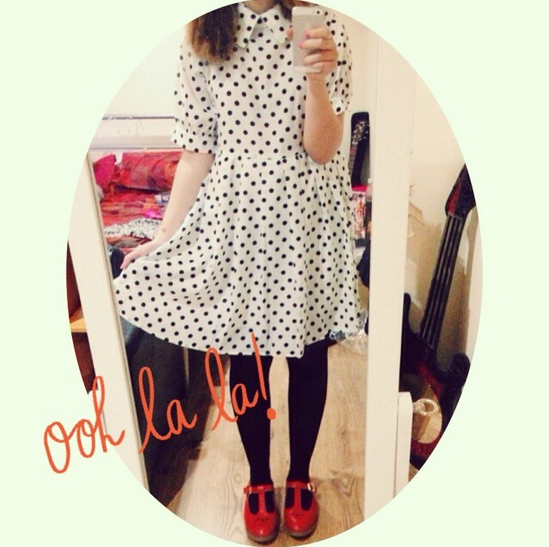 So it’s always my little secret mission whenever I’m out shopping to find my perfect little polka dot dress and there will never be enough of them in my wardrobe, ever. Although I think this is probably much to my boyfriend’s annoyance, as I often go around oooing and awwwing at every piece of polka dot pattern we spot when we’re out and about. Topshop is the worst place for this by the way. 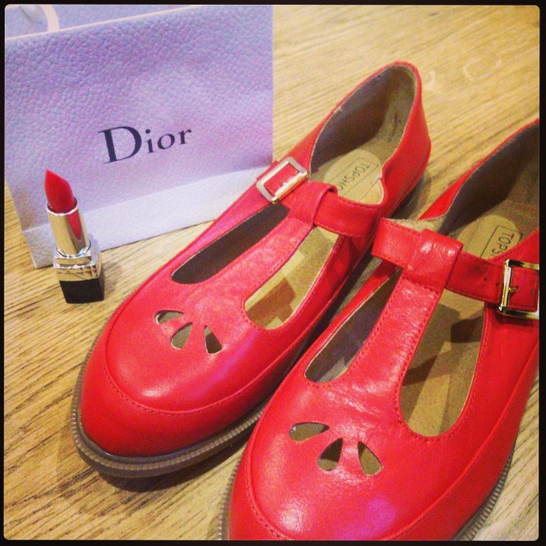 I’ll be teaming my White Pepper dress with these cute little red Topshop pumps, which only adds more fun to the childish appeal. Adding Dior Trafalgar lipstick, for good measure. There can never be enough polka dots or red lips in one’s lifetime and I’d like to officially welcome these little hombres into my ever growing collection. My first band tee, which was (if I remember correctly) probably Panic at the Disco or something just as remotely emo and was a spontaneous purchase, which was two sizes too small for me. But hey I was young and on a whim with a disposable income from my Saturday job and it ended up being commandeered by my much slimmer and petite sister anyway, damn my unfavourable genetics. So at the tender age of 15 I learnt my first valuable lesson, try before you buy. Sounds simple but we’ve all been there, arriving home to realise we’ve definitely under (or over) estimated out waist size. Other experiences for me have been buying my favourite band’s t-shirt, which came in a variety of colours, notably luminous pink and believing I looked like a rockstar. In reality I looked like someone who’d just been dragged backwards through a paint ball game. Lesson number two, less colour is often more. So after learning some valuable lessons about style along my journey past being a teenager, I think I’ve now finally got the band shirt thing sussed. Yes, finally. 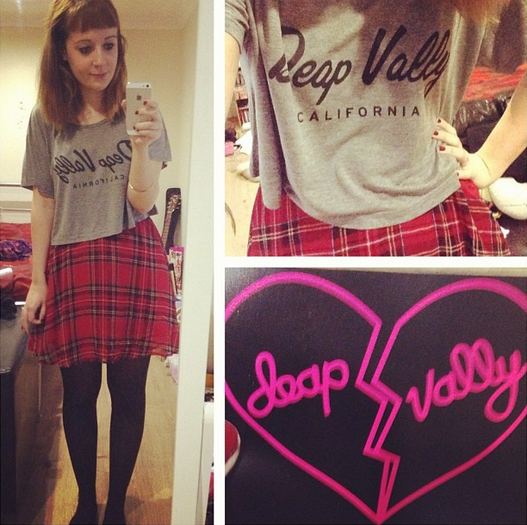 As proof that I’m not just lying about my new found style stakes, here’s a picture of me with my Deap Vally cropped t-shirt that I bought the other night. I love how simple the design is and it’s rare to find a band which have made something wearable past the point of the music venue’s doors. Another classic, which I picked up at Reading Festival is my iconic Strokes shirt. I say iconic because it’s most likely hung up in every wannabe hipsters wardrobe, but I don’t care, I love it. 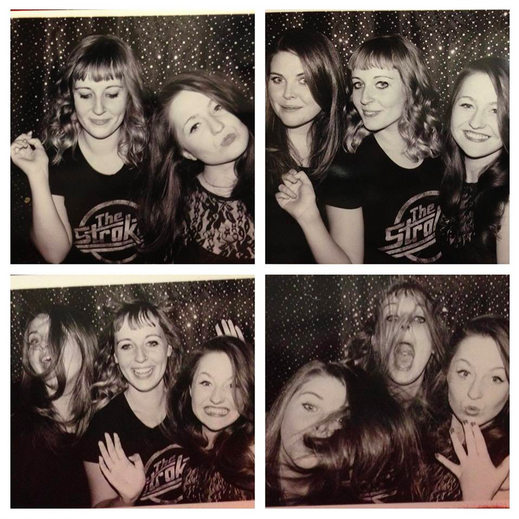 As you can see from the fun I’m having with my pals in a photo-booth wind machine (as you do), the simple design captures the coolness of the NYC scoundrels without looking OTT. Remember, less is more. 2. Be cautious of colour, if in doubt go with black. Instantly cool and understated. 3. Ask yourself, what would you wear it with? If you don’t know the answer then put it back. 4. Only wear a band shirt if you actually like the band. There’s nothing worse than seeing someone get caught out, no one likes a band phoney. 5. Wear it with a leather jacket and converse, never fails.